Can 'ordinary people' change the order of this world and succeed where prime ministers, defence ministers and special envoys have failed? Tsachi, Ella, Tsalik and Amir spent four years working for the release of the Israeli soldier, Gilad Shalit, who was kidnapped by Hamas militants from Gaza in 2006 and held incommunicado since then. Film director Ofra Gat-Yellin followed their efforts and became intimately involved with their work. Against the background of issues such as the Geneva code (POW rights), the privileges enjoyed by Hamas prisoners in Israeli jails, demonstrations at the Gaza border crossing points, and 'collective punishment' of the Gaza population, the activists realized how limited were their chances of influencing the events. At the same time they were guided by the Jewish principle: "Whoever saves one life - saves the world entire". A glimmer of hope appeared when, after three years and as a result of the release of 10 female Hamas prisoners, Hamas offered a videotape showing Gilad talking to the camera. 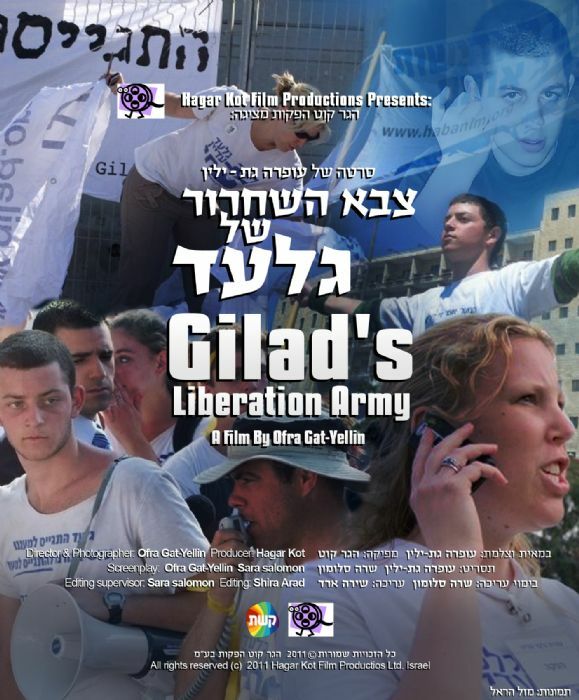 Toward the end of the third year of Gilad's imprisonment, the Shalit family organized a march of protest from the family's home in the Galilee to Jerusalem. Thousands joined. The march ended in front of the Prime Minister's office in Jerusalem. There, at Tsachi's initiative, a Tent of Protest was set up creating a demonstrative and continuous presence until, after more than five years in captivity, Gilad returned home.